The Fall has arrived and we find ourselves in another phase of life – Kaitlyn has begun kindergarten in Van and it has affected the whole family! She is enjoying her new routine, learning to read/write, how to be a well behaved student and playing on the playground. Kaleb is missing his sister and wishes she didn’t have to go to school all the time. 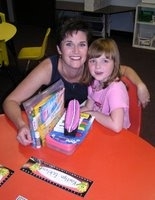 Kreig and Karen have shifted their schedules to get Kaitlyn up and out the door by 7:30. Early to bed, early to rise… We’re still waiting for the healthy, wealthy and wise part! As noted in our June newsletter, we are beginning the complex and protracted process of transitioning out of Mercy Ships. Information Technology (IT) plays a critical role in the operations of our hospital ships. Logistics, inventories, communications and patient records are all dependent on IT. As a result, it is important that Kreig’s expertise and leadership be available for the final preparations of the Africa Mercy. For this reason, we are planning to go to Newcastle, England, in the second half of November to join the ship. Kreig will assume the role of IT Manager and will supervise the installation, testing and troubleshooting of the IT systems onboard. Meanwhile, the shipyard is putting the finishing touches on the ship and we are anticipating a busy time of moving the crew onboard and ramping up operations! We expect the ship will remain in Northern England until January when she will begin her journey to West Africa. The first stop is Ghana to meet up with the Anastasis. During this time, Kreig will oversee IT operations for both ships and the consolidation of the IT departments as the Anastasis is taken out of service. Then, at the beginning of March 2007, Africa Mercy will begin a nine-month field service in Monrovia, Liberia, picking up where the Anastasis has been working for the last two years. Karen is eager to join the nursing staff on the Africa Mercy. She will again experience the joy and satisfaction of using her nursing skills to serve the many Africans without access to good medical care – the true reason for our mission. We are excited for this opportunity to work in Africa again and for Kaitlyn and Kaleb to share in the experience! In the fall of 2005, the Anastasis crew had a problem… they were just beginning the seven-month field service in Monrovia, Liberia and there wasn’t enough water. The ship needs fresh water to operate – a minimum of 50 tons of water per day! Without water, the crew can’t shower, instruments can’t be sterilized, laundry can’t be washed not to mention the need for drinking water. If the situation hadn’t changed, the ship would’ve had to leave Liberia. Of course, the bigger problem was not just the ship’s water supply, but the supply for the one million people who live in the city of Monrovia! At one time, Monrovia had a functioning water plant and distribution system. Unfortunately, it had all but quit functioning during the years of civil conflict and neglect. For several years, water was sold on the streets of Monrovia and carried by hand in plastic 10 gallon containers. Liberians refused to pay the water company because they weren’t getting water. Without income, the water company couldn’t make repairs. Something needed to be done to break the downward cycle. Beginning with the need for the ship, the Anastasis engineering staff began to investigate what they could do. At first they explored some contacts with the European Union (EU) which had recognized the problem in Monrovia and were planning to invest 2.5 Million Euros ($3.2M) into the water system. Knowing it could take months for the EU to begin, the staff began looking into the damage at the White Plains Water Plant located on the St. Paul River, 20km outside the city. When the team first visited the plant, only one of the four main pumps was marginally working and there were significant leaks throughout the distribution system. They estimated that the system could only operate at 15% of capacity. Anastasis Chief Engineer Richard Postles consulted with Ken Hilton, Manager of the ship’s Fabrication Shop. They felt overwhelmed by this daunting task as neither one had any experience with water treatment plants or these types of pumps. When they returned to the ship, they asked the Machinist, David Mitchell, if he thought they could restore the pumps. 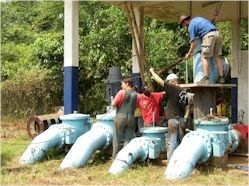 Amazingly, David had experience with that exact model of pump from a previous job! Encouraged, they decided to dive into the project. Over the course of the seven months in Liberia, they made steady progress rebuilding pumps, restoring hydraulic controls and repairing the distribution system. They worked during their evenings and weekends so that they could continue to cover their shipboard responsibilities. They funded the restoration by taking up a collection from the Anastasis crew and Churches at home. All in all, they spent $5,500 – the promise of millions from the EU is still unfulfilled. Along the way, they focused on training the Liberian staff at the water plant to continue the maintenance and restoration so that water would continue to flow after their departure. 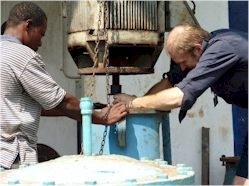 When the Anastasis left Liberia in June 2006, the water plant could produce all the water that could be distributed by operating 12 hours per day (200% capacity). As distribution lines throughout the city continue to be repaired, the plant can increase production up to 24 hours to keep up with demand. The downward cycle has been reversed as new water customers are happy to pay for running water and the new revenue can fund repairs! Would you prayerfully consider if you are able to partner with us by giving towards these needs? Visit the Donate section of this website for onling giving options. Include a note that says: “For the support of the Ecklunds”. Call Mercy Ships at 1-800-424-SHIP (7447) and ask to speak with Donor Services. They can take credit cards over the phone or set up monthly charges for credit cards or direct debit from your bank account.